Just after Wang Lijun was reported on “medical leave”, Bo Xilai went to Kunming on an inspection tour, with a special visit to a military museum. Chongqing news broadcast footage of the tour. Now it is probable that this tour and visit to the military museum were previously scheduled. However, within the context of the Wang Lijun debacle and the rise of the Princeling Party to power, these images of Chongqing’s Secretary inspecting toothpaste and toilet paper resonated ironically. During the revolutionary war, the People’s Liberation established six military regions: the Northeast (东北军区), the North (华北军区), the East (华东军区), the South (中南军区), the Southwest (西南军区) and the Northwest (西北军区). Each region had a General and a Political Commissar. Bo Xilai’s father, Bo Yibo was the Political Commissar of the North, Xi Jinping’s father, Xi Zhongxun was the Political Commissar of the Northwest, and Deng Xiaoping was the Political Commissar of the Southwest. Thus, in visiting Kunming, Bo Xilai was not simply going on an inspection tour, but also retracing the revolutionary steps of his father’s generation and thereby declaring his revolutionary lineage. 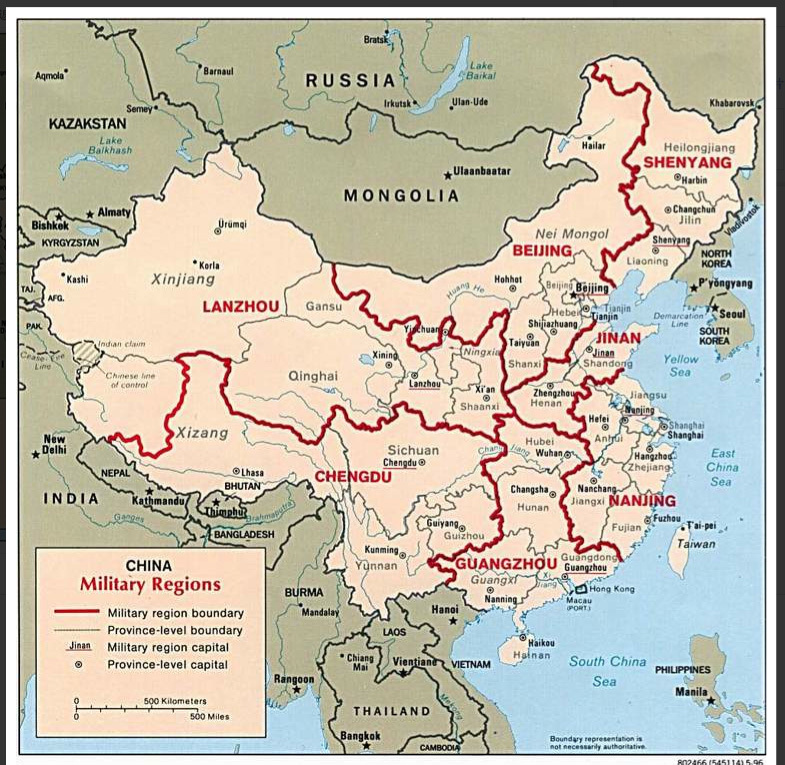 Today, China is divided into seven military regions, each of which has a general and a Political Commissar. As is evident from the map below, the Chengdu military region includes the independent city Chongqing and the provinces of Sichuan, Yunnan, and Tibet. Consequently, there is speculation that Wang Lijun was the counterterrorist liaison between China and the United States for the Chengdu military region and what he had to trade was information about the Tibetan independence movement. However, others suggest that his real value is deep knowledge of and participation in the repression of Falungong. Next installment: PM Harper’s 6 o’clock meeting with Bo Xilai. This entry was posted in noted, shenzhen elsewhere and tagged anti-terrorism, bo xilai, chinese politics, cosmography, deng xiaoping, history, pla military regions, political commissar, rumors, symbolic geography, tibet, wang lijun. Bookmark the permalink. I’m sorry to hear that you’re experiencing problems reading the blog. I think however it may be your browser because I don’t experience this problem when reading other wordpress blogs. “political subtext in chinese television: bo xilai, wang lijun, and pla history � Shenzhen Noted” ended up being a very good read and therefore I actually was in fact pretty glad to come across the blog post.